Embed media from external providers in a rich text module by adding the file's embed code to the module's source code. You can add videos hosted on an external provider (e.g. YouTube, Vimeo) or audio from an external source (e.g. Soundcloud) in your HubSpot content. 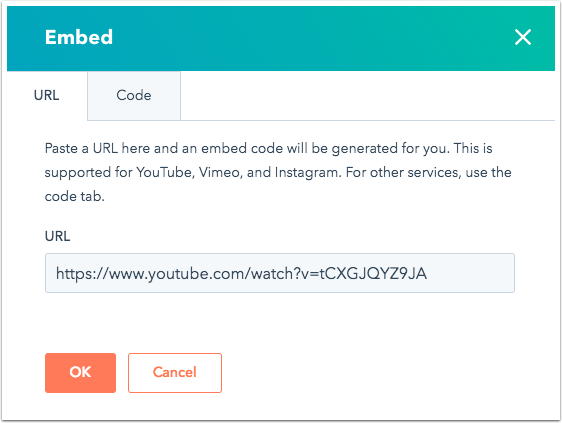 If you are embedding a Wistia video, you will need to first access your embed code. Learn more about the Wistia integration with HubSpot (Marketing Hub Professional and Enterprise only). 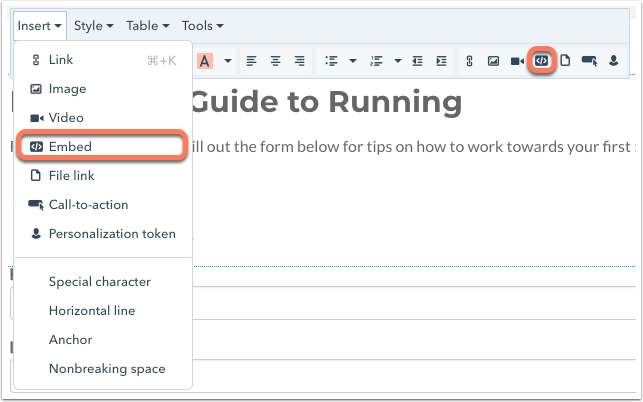 In your HubSpot account, navigate to website pages, landing pages, or blog posts. Hover over the page or post you want to add your media and click Edit. Click the rich text module where you are adding your media. Click Insert from the toolbar, then select Embed. Please note: Professional or Enterprise users will be given an option to enable the Vidyard integration. Learn more about using HubSpot Video powered by Vidyard to add videos to your HubSpot content. If you are embedding a YouTube, Vimeo, or Instagram video, you can stay on the URL tab and simply paste the video URL into the URL field. You can also paste in the file URL of a video or audio file you've uploaded to the file manager tool. Click OK. 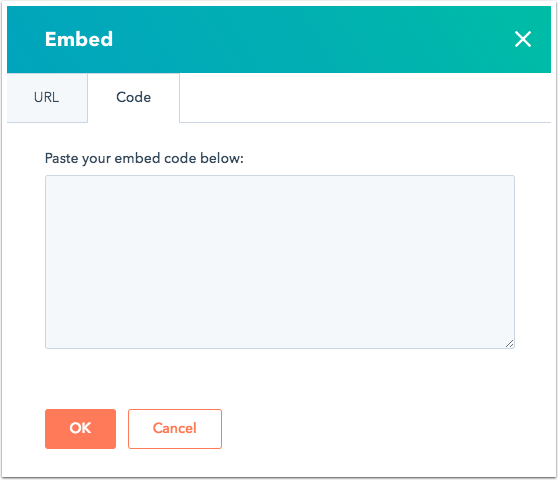 If the file has been uploaded using a service other than YouTube, Vimeo, or Instagram, click on the Code tab and paste the embed code into the field. Click OK.
On the upper right of the editor, click Update or Publish to make the changes live. The steps above are for adding a video to a rich text module. You can paste the inline embed code of a video directly into a coded module.